Annie Cardi holds an MFA in creative writing from Emerson College. Her short stories have appeared in the Georgetown Review, Vestal Review, and other publications. In 2011, PEN New England selected her as a winner of the Susan P. Bloom Children’s Book Discovery Award for the manuscript that would become The Chance You Won’t Return, her debut novel. Annie Cardi lives near Boston with her husband and a portrait of a sea captain. Cardi delves into issues of love, acceptance, loss and identity in her engaging debut novel. ... The author creates nuanced characters and presents them with their flaws and strengths intact, including a character with a mental disorder who never loses her humanity or becomes a caricature. ... [A] well-written, first-person narrative about negotiating life’s curve balls that has a realistic ending. An honest, uncompromising story. [A] candid and multilayered debut... Alex's voice is caustic, honest, and studded with humor. Cardi weaves elegant metaphors and incisive dialogue throughout her chapters, concluding with a wrenching sentiment about the necessity of sometimes allowing a lost loved one to find her own way home. Character development through the rendering of small detail is strong here, particularly with respect to Alex’s younger siblings, Katy and Teddy, who emerge in realistic response to their mother’s withdrawal from their lives. The result is a solidly crafted family story that sensitively explores the ripple effects of the temporary brokenness of one member. The novel’s central theme is a clever, deft twist on the idea of leaving home. ... A novelist to watch. Cardi presents a powerful look at family life and how it changes everything when you need to watch over your parent. 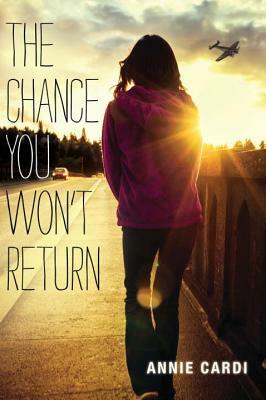 "The Chance You Won't Return" is a stunning debut novel featuring a profound exploration of family dynamics and the effects of mental illness. The story palpitates with a raw mix of emotions, including frustration and love, as Alex attempts to navigate a new world where her mother is no longer her mother. Cardi’s realistic treatment of the issues in this novel make for a poignant story that will stay with readers long after the final page is turned.